Mike Trout bats second for the Los Angeles Angels of Anaheim. In the eternally running discussion thread “Hey Bill” at billjamesonline.com, the website of sabermetric legend Bill James, the question came up of measuring the growth of sabermetric knowledge. James’s idea? Measure the extent to which teams are taking park factors into account when judging their rosters. But Tom Tango, author of “The Book,” offered another gauge: look at which teams are using good hitters in the No. 2 lineup slot. 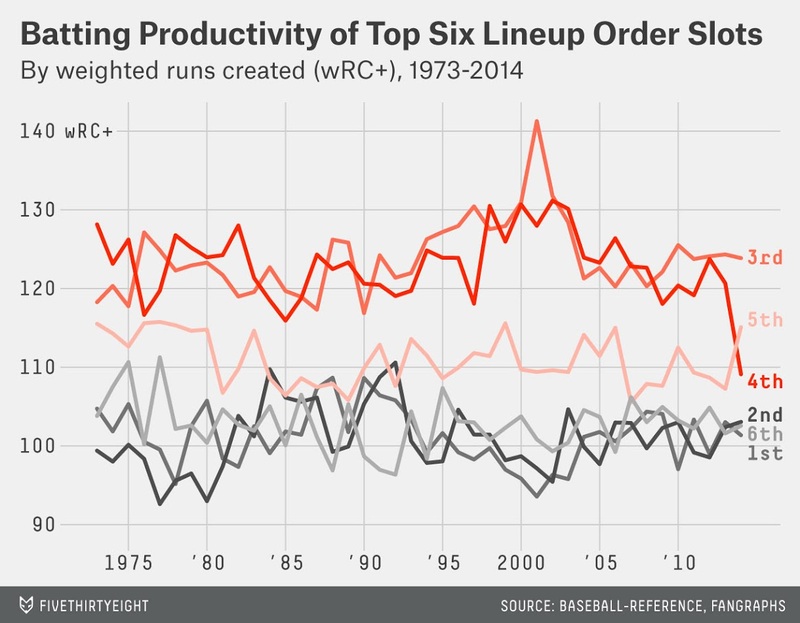 Historically, the quality levels of MLB leadoff and No. 2 hitters tend to track with each other — and contra the performances of third and fourth hitters. (Meanwhile, Nos. 5 and 6 have stayed fairly stable over the years, with the five slot outproducing six by a decent amount.) The good news is that it appears the two-hole has emerged from the dark ages of the mid-1990s to the mid-2000s, when slot Nos. 3 and 4 vastly outpaced Nos. 1 and 2. It may not be coincidental that the bleakest of times for the No. 2 spot came during MLB’s so-called steroid era. 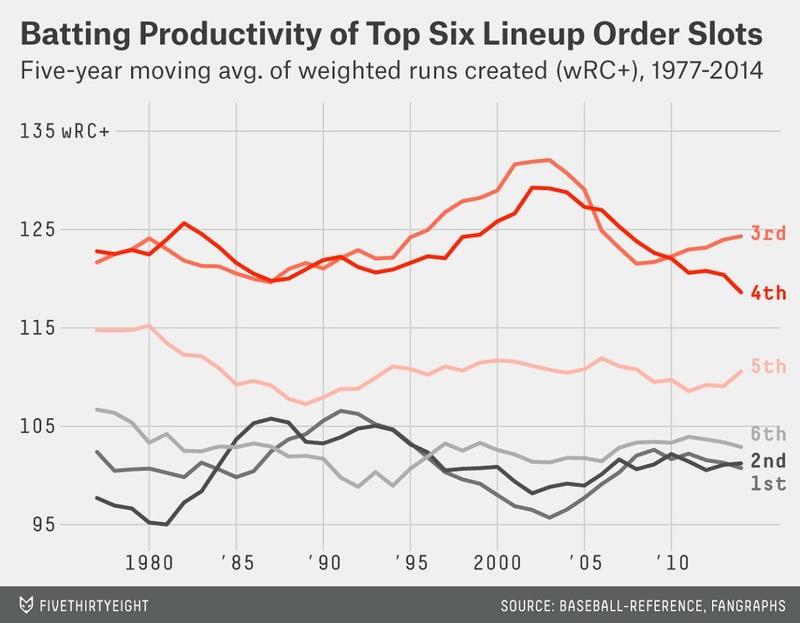 The stat we’re using, wRC+, compares a player’s per-plate appearance productivity against the average of all hitters, and the power hitters who frequently bat third and fourth may have received the benefits of performance-enhancing drugs at a greater rate than the overall population of MLB batters. (This would cause No. 2 hitters to move backward relative to the overall average, even if they themselves saw no change in talent.) With the specter of performance-enhancing drugs reduced in today’s game, the gap between hitter No. 2 and Nos. 3 and 4 has returned to its long-term norm. Still, today’s two-hole batters lag behind those of the halcyon late 1980s and early 1990s, when players such as Ryne Sandberg, Tony Gwynn, Wade Boggs, Roberto Alomar, Julio Franco and Lou Whitaker were doing a large share of their damage from the second spot in the lineup. It’s plausible that the conditions of the game back then simply favored the traditional archetype of the No. 2 hitter more (batting averages were higher, as was the ratio of on-base percentage to slugging), but today’s managers also don’t appear to be moving toward the sabermetric ideal of penciling the team’s best hitter into the No. 2 spot. Sabermetrics has come a long way since the first analysts began tinkering with mathematical models, and there are certainly places where statistical thinking has made its way onto the field (for example, the explosion of defensive shifts in today’s game is rooted in probability theory regarding where a batter is most likely to hit the ball). But when it comes to the two-hole, baseball’s decision-makers still have a bit of a climb ahead of them.